Anne & Tony Farrera of Brooksville, Maine, walk down their slope to close up their greenhouse for the night. it is February. Inside it is toasty although we had more snow the evening before. Tony started a Greenhouse program a few years ago. He and a friend, Tom Adamo, build numerous greenhouses of various sizes and styles in the area, including one for the local elementary school. They took orders, ordered materials in bulk, carefully researched, then had them delivered. participants picked them up. 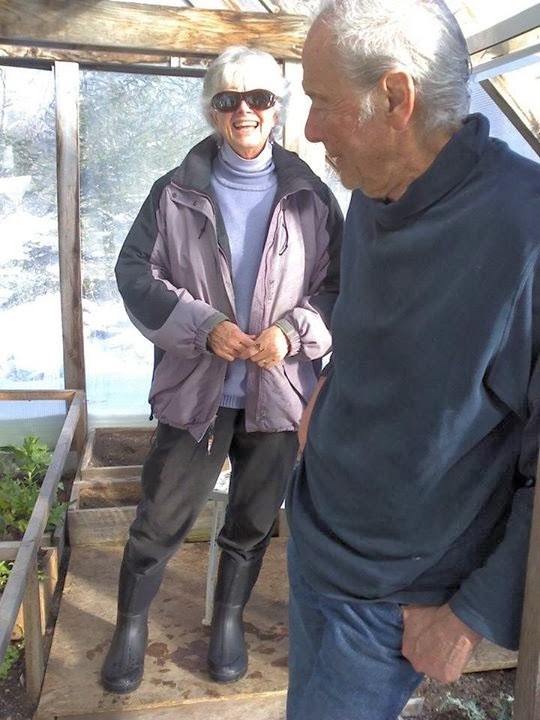 the structures were built by participants sharing the work with Tony & Tom.. Tony & Anne harvest greens all winter. remarkable considering zub zero nights. I’ll be spending time in the coming year with Andy Birdsall over at Horsepower Farm in Penobscot. I’ve been roped-in to a peninsula-wide Farm/Arts Exchange. It reminds me a little of the Depression-era Federal Writers’ Project: writers and artists in dialogue with farmers, everyone producing something. As usual, I’m wondering how I’ve gotten myself into such an enterprise. The closest I’ve ever been to a farm is patronizing the area’s many roadside produce stands. So, right from the start, I feel the need to confess to Andy my sorry ignorance of all things farming. It turns out he’s game, despite my naïveté. We strike a partnership for the months ahead: Andy will do the worrying and the farming; I’ll do the wondering and the writing. I find that my job may prove easier than I first thought it would be. Andy turns out to be that rare bloom of a garrulous fellow planted in a field of laconic Downeast Maine farmers. From the moment we meet on a cold December morning, he is willing, even eager to give me the insider’s view of what small, organic farming in Maine is all about. Andy Birdsall is a believer. He speaks passionately, works diligently and feels deeply about how and why he pursues this beguiling, bedeviling calling in life. To me, the whole thing seems bewildering and a little overwhelming. One thing is clear from the start: there’s so much effort in this for so little gain. After we stand around talking in the icy farmyard for longer than I’d expected, Andy invites me into the ancient farmhouse where his father Paul, the founder of the farm and a widower of thirteen years, lives alone. We enter through a mudroom now converted into a farm store with eggs and turnips, onions and potatoes proudly on display. We pass into the bright and sparsely furnished main room, where eighty-six year-old Paul sits waiting. He’s about to be on his way to Augusta for a meeting with colleagues who are working to support small farming in Maine. But he has time enough to meet me and share a little of what’s on his mind and heart. I’m not prepared for the vigorous lecture on farming and politics he’s about to deliver. “They’re trying to blur any distinction between small-scale farming and big-time food processing,” Paul continues. “It’s a ‘one size fits all’ policy in terms of regulation but with the huge subsidies going to the big guys.” We’re worried that we’ll be hammered with regulations which will make it tough for us to keep going! Once they make me a food processor, for example, I’ll have to run a very costly test of my surface water once a week. And they’d prefer that no animals be kept within two miles of food-growing operations. But small farms have animals!” “And composted manure is very healthy!” Andy chimes in. I do my best to listen carefully to all this, but become distracted by a pervasive presence in the room. It’s nothing more but nothing less than a glowing, heart-catching beauty. The sun streams though the farmhouse windows splashing light on the soft hues of the painted walls and the room’s simple furniture. It’s as if Andrew Wyeth composed this scene and was about to paint it: the elderly farmer seated in the ladder-back chair beside the gigantic stone hearth, the radiant light suffusing the unadorned room. Everything seems to shimmer. I wonder if anyone else notices. “And then your timing has to be just right. Take the potatoes: if you don’t hill the potato plants at just the right moment, they’ll be overwhelmed by weeds. If you miss weeding, a week later they’ll be four times as high. And there’s always the unpredictables you can’t control. Last summer, we had three weeks of hot, humid weather followed by a week of moist, damp days. The mildew set in and there was nothing I could do. I watched most of those beans die on the vine." Andy felt the need to explain further: "Because the past summer’s weather was so hard on us, I guess I’m sounding a little blue. But I’m looking forward to this year and I've got new plans. You see, I grow every year as a farmer, right along with my plants!" Delight and struggle, you’re never sure which motif will dominate the conversation, and sometimes it’s both at once. Andy takes me out to the barnyard to meet the sheep. “Fine animals,” he calls them, pointing out the mix of breeds that have gone into the graded flock: Suffolk, Cheviot, Jacob, Columbia, Romney, Rambouillet, Dorset. “My mother started the flock 40 years ago,” he says with quiet pride. Then he points to the ram. “He’s new, a pretty good fellow. We got him to replace the one we had. That guy was a mean son of a ewe,” Andy scowls. “He butted me a couple of times and compressed the coccyx in my lower back. Sometimes, it’s a battle around here!” he declares. We move on to view the farm’s proudest heritage, the Suffolk Punch horses that power the farm. As soon as we enter the barn, the draft horses lope in from the frozen pasture to greet us. “They’re an English breed,” Andy instructs me. “They’re short-legged, built low and beefy with good hooves. Often we let them go unshod. Dad and my son Drew work them full time. Four were born here, the rest came from Pennsylvania. The sire’s from Ontario. They’ve each got a name and a personality to go with it: this here’s Emma, that’s Louie. Harry’s over there behind Jake. Here’s Riley and that’s the matriarch, Cindy. There’s a pecking order among them and a lot of different dispositions to sort out." I bid Andy goodbye for now and climb into my car. I drive down the ridge, leaving the five-hundred acre farm behind me. I know it’s much too soon for me to understand it all. Still, I try to make provisional sense of what I’ve just encountered: chronic disappointment without a hint of despair, pervasive frustration tempered by enduring hope, tough realism holding hands with childlike wonder. I ask myself how anyone could persist in this harsh heartache of a way of life and the answer comes immediately: it’s the earthy sense of wonder, the understated joy, the deep-set satisfaction these farmers inevitably find there in the back-breaking daily struggle. Not simply entrapped in anxious striving, they’re also enthralled by a tender beauty. Again, I think of Wyeth: the whole morning felt like I’d stepped into one of his severe paintings and caught a glimpse of a surprising, aching comeliness poised on the edge of heartache and hope.